In October 2015, the current term of assembly in Bihar is getting over, so soon in September- October, 2015,there will be fresh elections in Bihar for Vidhan Sabha 2015 (Assembly Election 2015). There are total 243 seats in Bihar Legislative Assembly (Bihar Vidhan Sabha). 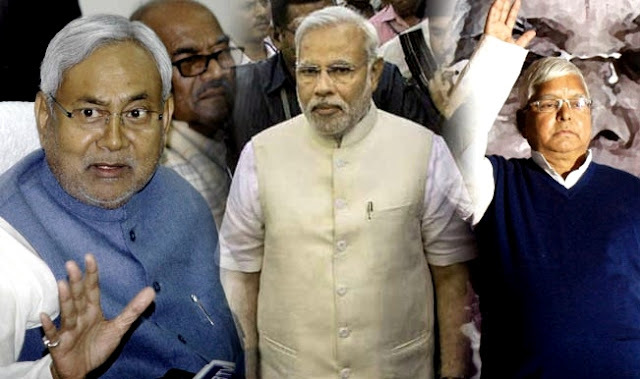 The Major parties who going to contest Bihar Assembly Election 2015 are NDA Group and Janta Parivar. In Janta Parivar there are JDU (Janata Dal (United)), RJD (Rashtriya Janata Dal), Indian National Congress, CPI (Communist Party of India). And in NDA Group, we have Bhartiya Janta Party (BJP), LJP (Lok Janshakti Party), Rashtriya Lok Samata Party and Hindustani Awam Morcha (HAM). Janta parivar (which was first formed in 1989 when all opposition parties joined as one party against Indian National Congress), at that time Nitish Kumar's JDU and Lalu Prasad Yadav's (RJD) were together. Later, for Bihar Assembly Election they both separated and Nitish Kumar (joined with BJP) and fought against "Jungle Raaj" of Lalu prasad yadav in bihar. 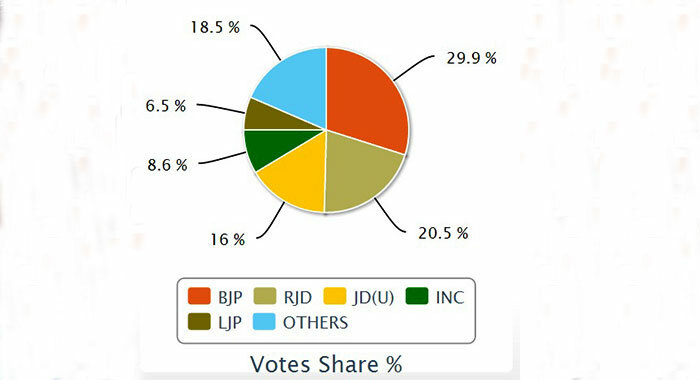 But In 2014 General Election, Both RJD and JDU lost bihar votes, JDU and RJD (with Congress) made Janta Parivar and now going to fight against BJP (As in NDA group, BJP is largest party). Since to get political mileage, Nitish Kumar (Chief minister of Bihar) has joined hands with RJD chief Lalu prasad Yadav, Thats all because Planets are not in favor of Nitish Kumar Right now. Nitish Kumar has Gemini (Mithun Lagna), which has Jupiter's Maha Dasha on going. And which create "Guru Chandal yog" with help of Rahu for nitish kumar. Which is creating problems and not favoring atmosphere for nitish kumar. (Recently Court banned "Badh Chala Bihar" Campaign and JDU lost in legislative council elections in Bihar). So, Nitish kumar who lost badly in general Election 2014, doing all political tactics to get power again. Joined hands with Jungle raaj fame Lalu yadav. And he has to because as per 2014 general election vote share, they will again lose (check below image). But in Gochar, Saturn giving tough fight to birth moon. Which is not good sign, even after Janta Parivar creating, Nitish Kumar has to loss CM seat. As per Astrological Calculation, Janta Parivar was created on 15th April 2015 ( at 5 PM), and at that time Virgo sign was on rise.And Rahu is already there, which created big confusion with virgo, which create DESPONDENCY and problems. Lagnesh Budh's eight house have bad planets like Sun and Mars which may not give fruitful results in election. Moon is creating KemDrum Yog in Janta Parivar (as per creating date) which will create lots of confusion (may be at seat sharing time) or even after election results. Currently, BJP has 91 MLAs, JDU has 115 MLAs, RJD has 22, Congress has 4 and others 11 MLAs in Bihar Bihar Legislative Assembly.